A better, healthier way to indulge your PSL craving. They’re heeeere. Starbucks’ Pumpkin Spice Lattes (or simply, PSL) made their fall debut recently, and while Starbucks’ PSL is a fan favorite, it’s probably fairly obvious that it isn’t a nutritional winner. It’s too bad because pumpkin contains plenty of healthy nutrients, and canned pumpkin puree is an easy way to get the benefits. A cup of canned pumpkin provides about 30% of your daily fiber needs, 10% of your potassium requirements, and more than 300% of your vitamin A targets. If you’re turning to a pumpkin spice latte or any number of packaged pumpkin spice products to enjoy these fall flavors, you’re really missing out on an upgrade. Here are some delicious idea that bring more nutritional bang for your buck while still honoring fall’s most craveable flavor. Making a batch of homemade granola is worth the minimal effort involved. Most store bought granola contains excessive amounts of added sugar, and few have high quality nuts and seeds that provide an added dose of nutrition. Here, in this piece from Sara Haas, RDN, you’ll find pecans and pumpkin seeds, which amp up the healthy fats, fiber, and protein, not to mention the flavor. Plus, this recipe contains canned pumpkin, an ingredient I’ve never seen in pre-packaged granola. This granola is all you need to add pumpkin spice flavor to smoothies and yogurt bowls. These gluten-free, vegan snack bars pack in some protein and fiber, which help crush between-meal hunger. In addition to the goodness from pumpkins, these bars get extra nutrition from almond butter. Almonds are a significant source of magnesium, a mineral that’s involved in blood glucose and blood pressure regulation. Surveys suggest that the majority of Americans don’t eat sufficient amounts of magnesium, putting them at risk for diabetes and heart disease. Oats, also used here, are another excellent source of this mineral. Instead of your usual bar, trade up to this homemade one. This fall treat is made with whole food ingredients, including apples, pumpkin puree and gluten free oats, which means your dessert plate is full of vitamins, minerals, and fiber to nourish your body. Plus, consuming fruit, including apples, has mood-nourishing benefits: A study involving more than 6,000 women who were followed for six years found that eating two or more servings of fruit per day was linked to a lower risk of depression and symptoms associated with the mood disorder. This is an apple crisp you can cozy up to all fall to promote those feelings of well-being. Healthy ingredients, including whole wheat pastry flour, whole grain oats and canned pumpkin make this treat better than your average muffin. And let’s get clear about carbs for a moment. Though you can certainly lose weight on a ketogenic plan, a balanced approach can be more sustainable and beneficial. In the latest analysis, both a high carb and a low carb plan were linked to higher death rates. The magic was in the middle: A 50-55% carb intake was associated with the lowest death rates, with those carbs coming from quality sources, including whole grains. Your weekends are about to get a pumpkin spice makeover. 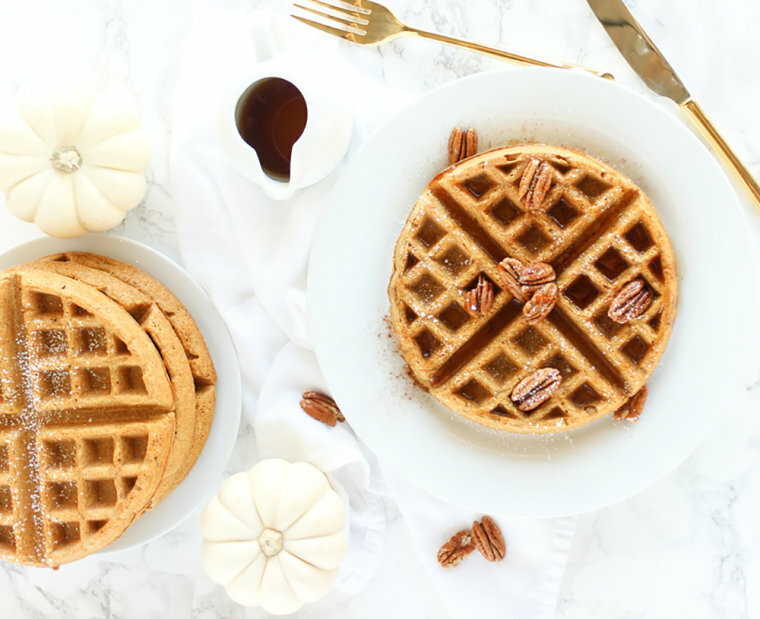 These waffles are made with white whole wheat flour. If you don’t already have this flour in your pantry, you’re going to want to make room for it. Traditional whole wheat flour is made from red wheat, which gives it the nutty flavor and darker color you may be familiar with. White whole wheat flour comes from a different wheat variety, which is why it’s lighter and milder than traditional whole wheat. Yet because it contains the intact components of the grain, it’s nutritionally equivalent to standard whole wheat flour. For home bakers, that means you can get the similar texture and taste of all purpose flour, but with all the goodness of whole grains. Try these waffles and taste for yourself. Transform your toast with this pumpkin spiced treat made from five simple ingredients. Though many specialty-flavored nut butters may have excessive amounts of added sugar, this version offers a significant sugar savings: There’s just one teaspoon in the entire 9-serving batch. If toast isn’t your thing, try it spread over apple or pear slices, or use a dab inside a sliced date. Though this recipe could not be simpler, if you don’t have a blender or just want an easy hack, mix your store bought nut butter (whether cashew, almond, or another) with some pumpkin spice. Banana bread has a rival in this pumpkin chocolate chip loaf. Stacey Mattinson MS, RD, lightened up her family recipe by using less sugar and swapping half the oil for unsweetened apple sauce. She also made it healthier by reducing the salt. If you’re going to put this loaf on heavy rotation, you may want to make it even more nutritious by swapping the all-purpose flour for white whole wheat flour. If your pumpkin spice cravings are a mix of salty and sweet, this roasted chickpea trail mix will hit the spot. Chickpeas have some serious snacking benefits, too. In one small study, after adding about 2/3 cup of chickpeas per day for a period of 12 weeks, participants’ food diaries revealed they were eating less of other fare, especially grains, yet they felt more satisfied. Four weeks after returning to their eating routine (and thus, eating fewer chickpeas), they were eating significantly more processed snack foods. The real foods combined in this trail mix will help you snack your way to satisfaction.